This past weekend, I caught a good case of the Wintertime Blues. I woke up on Saturday morning mopey and peevish, and generally felt like a house off its foundation. The cold weather and short days tend to do that, don’t they? Do you ever feel that way, too? Normally, a long walk outside helps, as does a long hug from a friend. You know what else comforts me? Baking. The intoxicating smell of butter and brown sugar whipped together. The movement of batter, undulating, and folding into itself. The clash of colours and textures: powdery white flour; bright, bold yolks; deep, dark vanilla pods. So, after lacing up my boots for an urban hike around the city, I went home to take some proverbial lemons and make…lemon poppyseed ricotta cake. I can’t tell you how therapeutic it was to grate that lemon rind into tiny, fragrant flakes of yellow. How consoling it was to watch, almost trance-like, as my mixer beat those ingredients into submission. How gratifying it was to take that first slice, and bite into a warm, tart, sweetness that my two hands made. Directions 1. Preheat the oven to 325°F, then grease the loaf tin with butter and dust with flour. 2. Using the paddle attachement on your mixer, cream together the butter and caster sugar. Add the eggs one at a time, mixing well after each addition and scraping down the sides of the bowl. 3. 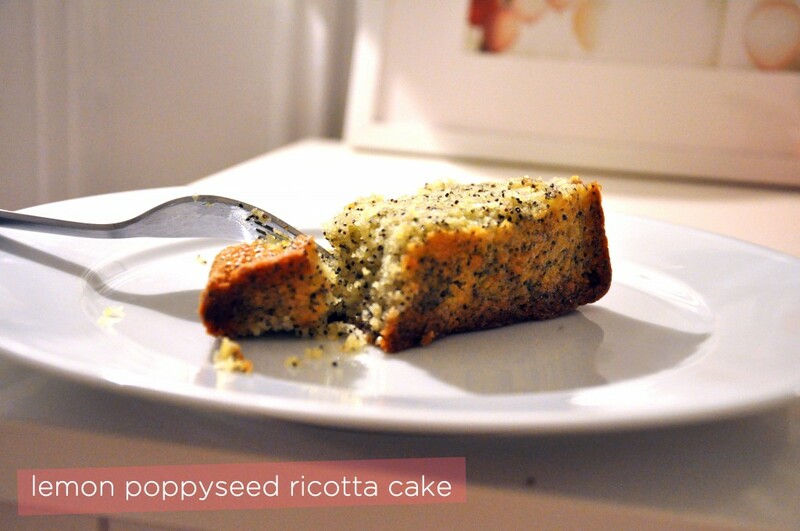 In a separate bowl, sift together the flour, baking powder and salt, then mix in the poppy seeds and lemon zest. Add these dry ingredients to the creamed butter and sugar in three stages and on a low speed, mixing well between each addition and adding the milk after the second batch of dry ingredients. Increase the speed to medium and keep mixing until the batter is smooth and even, then mix in the ricotta cheese. 4. Pour the batter into the prepared loaf tin and bake in the oven for 50-60 minutes, or until the sponge bounces back when lightly pressed and a skewer inserted into the middle of the cake comes out clean, with no uncooked batter sticking to it. 5. While the cake is baking, put the lemon juice, water and sugar in a small saucepan and bring to boil, allowing the syrup to reduce by about half. 6. When the cake is cooked, pour the syrup over it while it is still hot. allowing it to soak into the sponge. Leave the loaf to cool a little before turning it out of the tin on a wire rack to cool down fully before serving.